Helded in the heart of Saint-Germain-des-Prés, near the famous place Furstenberg, a lovely quaint appartment, located on the 3rd floor of an old building, with elevator. Bright, sunny, high ceiling, wooden beams. Hallway, separate toilet, fully equiped kitchen (oven, gas-burners, dishwasher, washing-machine, large sitting-room with sleepcouch (can accomodate 1).TV,DVD,CD player etc. 2 bedrooms : one with a kingsize bed and 2 single beds, separate bathroom. I recently rented Marie's apartment for 3 weeks and invited friends and family to come for visits a week at a time. It worked out beautifully. We had everything we needed, the beds were comfortable, the apartment was bright and pleasant, and the elevator was a godsend when we had luggage or were tired from our days exploring Paris. We liked the european style of bathtub/shower and sink in one room and the toilet and sink in another -- very efficient for 3 women all trying to get ready at the same time. The washing machine was a nice feature too. Marie is friendly and helpful and very easy to work with. The location can't be beat -- close to everything central Paris has to offer, near metro and bus routes, around the corner from cafes, boulangeries, and markets. I recommend this apartment. We loved our time in this wonderful apartment. It is incredibly well-located, walking distance to many museums, restaurants, parks, many great galleries. Lovely cheese and fruit/veg vendors and great patisserie/boulangerie 2 blocks away (one of the best chocolate/almond croissants and baguettes I've ever had). We took the metro only 3-4 times and there are multiple lines 3 min walk from the apartment. It is bright, fairly quiet (only awoken by garbage truck one morning, and never by evening street noise). Beds are comfortable. Owner was very responsive and representative met us early after our 6am arrival to let us into the apartment. Kitchen is small but serviceable and has dishwasher. Apartment is fairly small but with lovely and spacious sitting area; shared bathroom made it perfect for our family of 3 but it may be a bit close/intimate for 2 couples. Washer but no dryer, but you can hang clothes on indoor line. We would likely stay here again for our next trip to Paris and we rarely ever stay in same place twice!! The beds were all very comfortable, the apartment was quiet, and the main living room is light and well appointed. Marie was very kind and helpful. We would consider renting the apartment again. The location is wonderful. I am a yearly Paris visitor to the Saint Germain area and this apartment was in the best location I have rented. The apartment is very close to the Seine, the grocery store, the rue Buci, so fun! We had a wonderful stay in this property for my father-in-law's 80th birthday and his first trip to Paris. It had everything we needed, was very comfortable, and the common space was perfect for dining, visiting, and relaxing. The elevator was ideal for my in-laws, although the stairs are quite doable as well. The apartment is full of natural light and stocked with plenty of good books, music options, and beautiful art. The location is ideal. There are dining, shopping, market, and destination options within easy walking distance. We would absolutely stay here again! Oh thanks a lot Jennifer you are so nice. You are welcome when you want. And we like very much our place and like to share with nice people like you ! The apartment on Rue Jacob had a huge living room, very high ceilings, a modern bath (toilet in separate cubicle) and handsome modern furnishings, including many books, much china. 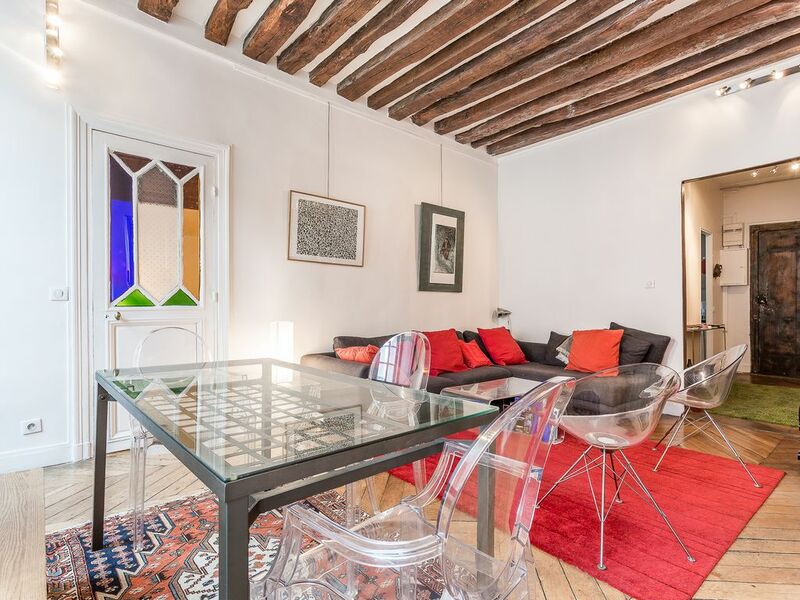 The location is perfect: walking distance to Musee d'Orsay, Louvre, many other attractions. Though many restaurants were closed in August, enough small ones were open in the area to keep us well fed. This is a wonderful place from which to explore Paris. Lovely apartment and neighborhood. The apartment in this historical building is very charming with big windows and lots of light. It was very comfortable and had whatever we needed for our week long stay. The neighborhood was perfect, and it was an easy walk to so many places we wanted to see including The Louvre, the Musée d’Orsay, The Tuileries, Luxembourg Gardens, Notre Dame and more. There are many interesting shops nearby as it’s in a design district. The Musée Eugene Delacroix and it’s beautiful garden is less than a block away and it’s an exquisite hidden oasis in this neighborhood. The apartment is on a quiet street but just a few blocks from a busy area filled with cafes. There are also markets nearby where you can buy whatever you need for picnics in the parks or along the Seine. We highly recommend this apartment. The owner responded immediately to every question and anything we needed. When I return to Paris I would love stay here again! near metros, bus and taxis stations Saint-Germain des Prés and Mabillon.Near the railstation. Many possibilities to go in all the places of Paris and France. Near the pittoresque and nice marché de Buci where you can find typical products for your little diners at the appartment. Many restaurants of every country (chinese, japanese, indian, lebanon, greek...) and many gastronomiques restaurants whith "Grands Chefs Français". Jazz bars and the best Art Gallerys in Paris. "Grands Couturiers" are in the area. You are near the Delacroix museum and near Notre-Dame and the Louvre, l'Ile Saint-Louis and the Jardin du Luxembourg. You can along the Seine or take a drink in the famous "Café de Flore" or "Les Deux Magots"to enjoy your trip in Saint Germain des Prés. tarif dégressif en fonction de la durée, caution demandée de 500€, acompte/arrhes à la réservation 30% l'arrivée peut se faire n'importe quel jour de la semaine si celui-ci est disponible. les arrhes seront conservés en cas de désistement. chiens ( autorisés si sages et propres ). supplément chauffage selon la saison.